Discussion in 'Masonic Blogs' started by My Freemasonry, Dec 16, 2011. The Freemasons in Midland, Texas are celebrating their 125th anniversary this week. "I'm just so excited," said Olin McMillan, worshipful master of Lodge 623. "We're not the oldest institution in Midland, but for 125 years, we've been providing continuous service." Masons are a group of men who share the virtues of honesty, morality, integrity and tolerance, officials said. 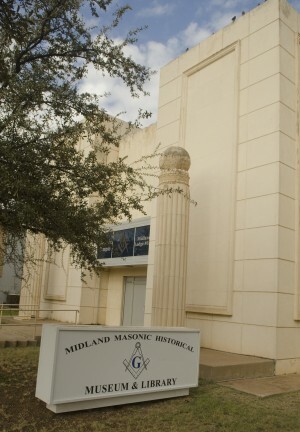 The first Masonic Lodge in Midland was founded on July 30, 1886, only five years after the establishment of the town of Midway -- which became Midland. The post office was established two years in 1884 and Midland County in 1885. Charter members included the county's first clerk, attorney, sheriff and treasurer. Other members included W.E. Bailey, the city's first doctor, and J.C. Peoples, who was instrumental in organizing First Presbyterian Church in 1885, McMillan said. Eastern Star -- the women's arm of the lodge -- was created in 1887 and received its official charter in 1905. The Order of the Rainbow for Girls was chartered in November 1948, records indicate. Members have been in their current building, 1600 W. Wall St., since 1953. Congratulations to all the masons in my hometown. I grew up seeing the lodge on Wall Street. That's awesome! I was born in Odessa and lived in Midland till I was 5. Man, that pic looks like a mini GL!